Since our children were 3-4 years old, we started doing science activities together (see our science activities). Oh, is it too young for them to understand science? Of course, I did not introduce to them concepts like Newton's law of universal gravitation or Darwin's theory of evolution! Through conducting simple science activities, children develop their observational, analytical and evaluation skills. How do we, as parents, inspire children to love science? You may have planned what you want teach your children. But sometimes, the children do not seem to be interested in your plan. They just want to play balls! Playing ball also introduces science concepts! Get the children to observe what happen when they throw the ball harder, what happen when they throw the ball upwards, what happen when they throw the ball against the wall. All these observations help them learn about forces. Let the children have a say in what they want to do, and from there, look out for the learning opportunities in the activity that they are engaged in. Read science-related books with the children, so that they are exposed to scientific terms. 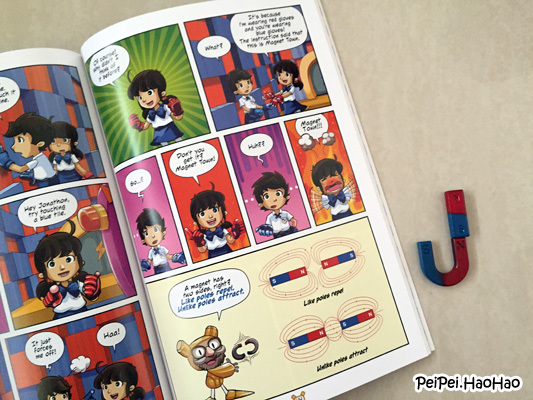 One of the science-related books that my children enjoy reading is JJ's Science Adventure: Magnet. Other than science-related books, we can also introduce children science concepts through story books. For example, when we read Gruffalo's Child, the children learnt about how the mouse cast his shadow, and how to make the shadow bigger or smaller (read the details of this activity here). Home experiment can be very simple, and do not need to spend too much money to get the materials. For example, use whatever that can be found at home to create simple Rube Goldberg machine, for children to learn about causes and effects. Things that are not available at home, for example, flowers for dyed flower experiment, choose the cheaper alternatives - we bought white chrysanthemum instead of white roses. Another interesting home experiment is cooking! Read our sharing on 10 things children learn through cooking and simple recipes for cooking with children! In Singapore, there are many places for children to learn about science, for example, parks, Singapore Zoo, Singapore Botanic Gardens, Marina Barrage, and factory tours like Yakult Singapore. Children love asking questions. Why is the sky blue? Why does thunder happen after lightning? Sometimes I also don't know the answers! Take the opportunity to find out the answers with the children. Remember, involve the children in the investigation, for example, reading from books, conducting simple experiment! And ask them questions - What do they think? Why do they think so? How would you encourage your children to love science? Great that your children love reading science books! We first dabbled with science when I bought a "Big Bag of Science" kit from Amazon. There were all sorts of cool experiments inside, with special crystal materials and 'gravity goo' etc. Not expensive since there was so much stuff! My 3 year old started asking 'can we do experiments today?' haha. Thanks for sharing about the kit. We usually just use materials that are available at home. Thank you waiwai for sharing! Your home experiments are so interesting! Another way to encourage my boy to love science is that I try to help him answer or find out together all the never ending questions he has! It can range from what's kidney stone to what's the plane wings for etc. I taught him to find the answers through go ogling! Thanks Ting! Wow, your boy is asking about kidney stone at such a young age! Your experiments at home so cool! Not till a few more years before I have to crack my mind for such cool ideas with my little ones. Though Ayra has started asking to make volcano at home. LOL. We haven't tried making volcano at home, but we used the same concept to make a plastic boat that is propelled by the gas produced during the chemical reaction. Out of all, I love the cooking one best! Produces science knowledge and yummy food! Thanks for sharing! Cooking is science + art! Role modeling is the best war to inspire children! Love this post Wai Wai! I just private messaged some girlfriends your link to this post! Agree that science can be taught in everyday on-goings. Just yesterday, my son was playing w our fan (ours is an industrial fan which can blow air upwards) and placed his balloon on it. He was totally blown away that his balloon stayed afloat for so long! That sparkle in his eyes was really bright! Thank you May! Hope your friends find this post useful. When I was in NIE as a young untrained teacher, many of my Biology lecturers enthused me with their passion and love for Science. One of them would always point us to interesting facts and live specimens around us. This made me very excited to learn more too. In the same way, I do that with my children to let them see the wonders of nature and how things work. Thanks simplylambchops for sharing! As parents, role modeling is very important, not just in loving of science, but in all other aspects too!